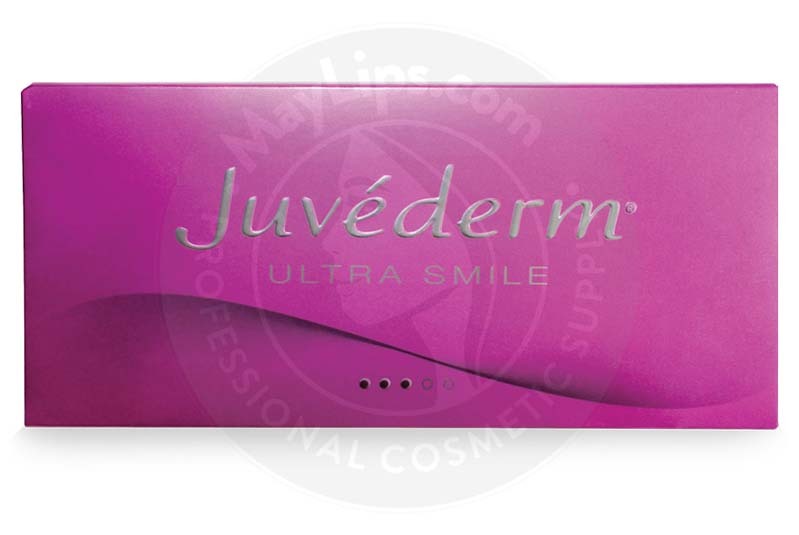 Juvederm Ultra Smile is an injectable gel manufactured by leading pharmaceutical company, Allergan. This gel is formulated for lip enhancements and has a hyaluronic acid concentration of 24mg/mL. Your patients can also benefit from a pain-free treatment due to the 3mg/mL addition of lidocaine. These hyaluronic acid molecules are derived from Streptococci bacteria fermentation and the resulting gel is highly biocompatible, biodegradable, and is free from pathogens. 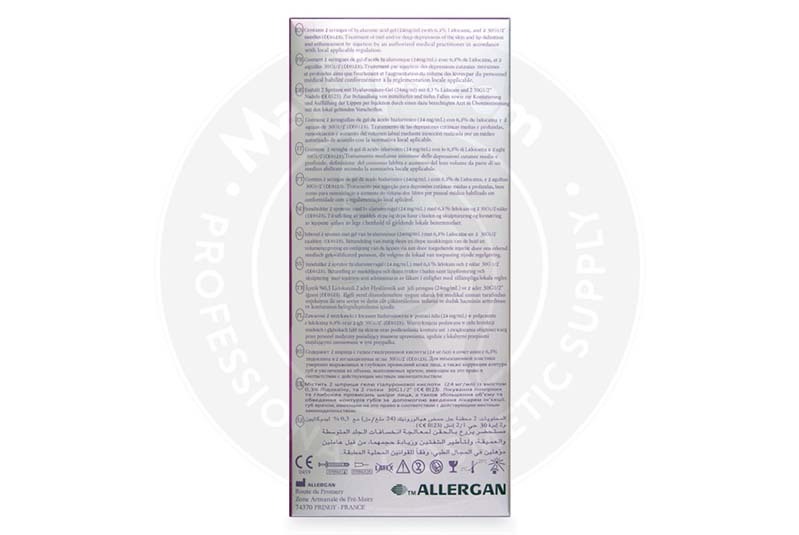 A box of this lip boosting medical device comes with 2-0.55mL prefilled syringes, 2 sterile 30G1⁄2” needles, traceability labels, and an information leaflet. Juvederm Ultra Smile is an effective medical device used to volumise thin lips. Poorly defined lips can get a defined and contoured voluptuous look. In addition, fine lines around the lips can be erased. Even patients experiencing lip dehydration can benefit greatly after treatment with this cosmetic filler. As a result, a patient’s lips look more luscious and well-shaped. From eating to displaying facial expressions, lips are constantly mobile. Lips are very sensitive as they are filled with large network of blood vessels and nerve endings. The size of one’s lips depends greatly on genetics, lifestyle habits, and age. 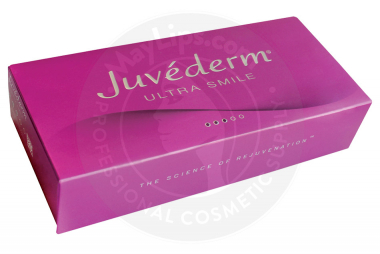 Use Juvederm Ultra Smile for lip augmentation to plump up and define thin, shapeless lips. These effects are made possible by the smooth and gentle hyaluronic acid gel. When injected, the gel immediately expands within the skin and the underlying cells are hydrated. As a result, the lips look fuller and well-moisturised with desirable shape and volume. How to inject Juvederm Ultra Smile? Prior to treatment, check the expiry date on the box and ensure that the contents are properly sealed. As the lip region is extremely sensitive, you may apply additional numbing cream on the sanitised targeted area. Inject Juvederm Ultra Smile into the lip mucosa using the nappage technique. Gently massage the treated area to ensure seamless placement of gel. After injections, inform patients to avoid makeup for at least 12 hours. They should also avoid exposure to extreme temperatures like sauna, hammam sessions, direct sunlight, and cold places for 2 weeks following treatment. Do not overcorrect, as it may cause unnatural results. A single treatment of Juvederm Ultra Smile can last up to a year. After that, the biocompatible gel will be absorbed into the surrounding tissues. Your patients may then opt for yearly touch-up sessions to maintain their alluring pout. Individuals who tend to develop raised scars. Patients with skin inflammation or infections (e.g. herpes or acne) should wait until the skin has healed completely before undergoing Juvederm Ultra Smile injections. Your patients may experience some usual post-injection reactions that are the body’s natural response to injections. These reactions usually last for a week and should subside quickly if proper aftercare methods are followed. There are also instances where your patients may experience severe reactions. Advise your patients to seek medical attention if they do not recover from the reactions within a week. Juvederm Ultra Smile is made of highly cross-linked hyaluronic acid molecules. These molecules are manufactured from Streptococci bacteria fermentation. 0.3% local anaesthetic lidocaine has also been added as a pain reliever. Ingredients: Hyaluronic acid gel (24 mg/mL); Lidocaine hydrochloride (3 mg/mL). 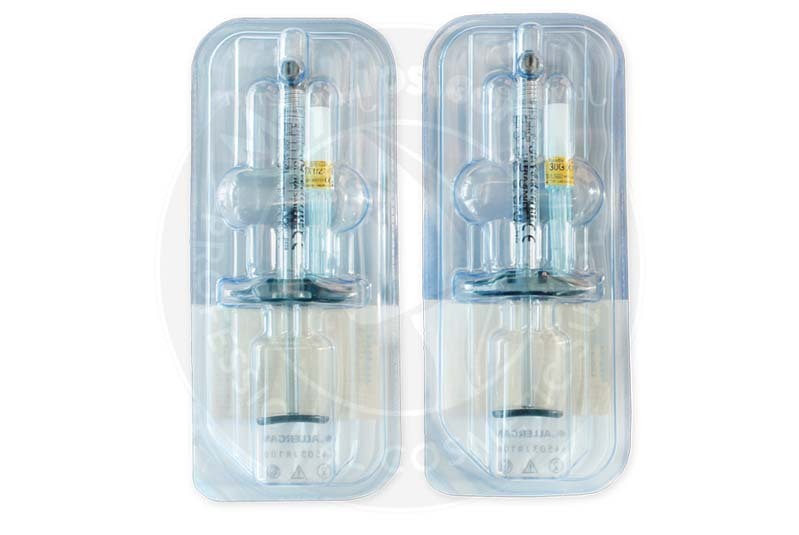 Size 2x0.55 mL pre-filled syringe. Also Included: For each syringe, the box contains one sterile 30G1/2” needle. Package insert. A set of labels in order to ensure traceability.